I went out to my mothers house today, and I have to say the yard looks great. Thanks so much I will recommend your service. We realize that most customers are quick to call or send a complaint letter, but to me it is just as important to recognize someone good and outstanding. Therefore, I feel obligated to bring one of your employees to your attention. Fortunately, we “found” your business Vets 4 Hire and both my husband and I cannot thank you enough for the great job you are doing. Late July you stopped by and surveyed the situation we had (porch, windows and commodes that needed some fixing) and not only did you give us a good estimate but let us know that Mark would be at our house on August 6th. Well he certainly did come in a timely manner. Mark did an OUTSTANDING job and all we can say is hats off to you for hiring such a hard-working young man. 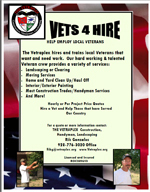 As I mentioned to you Rik, we will continue to recommend Vets 4 Hire to our friends and relatives.